Bonjour and welcome to the Art of the Home gallery of small backyard pool ideas…we hope you enjoy the visit! The best memories are the simple ones made with family and friends. With your own swimming pool, it’s always a good time to create new ones. Many homes nowadays are not equipped with large backyards but don’t let that deter you from building a petite oasis for the family. Pools have the ability to liven up an outdoor space — whether for entertainment or just hanging out. Some are good for fitness and exercise, while others are winsome enough to dip in during a warm summer day. 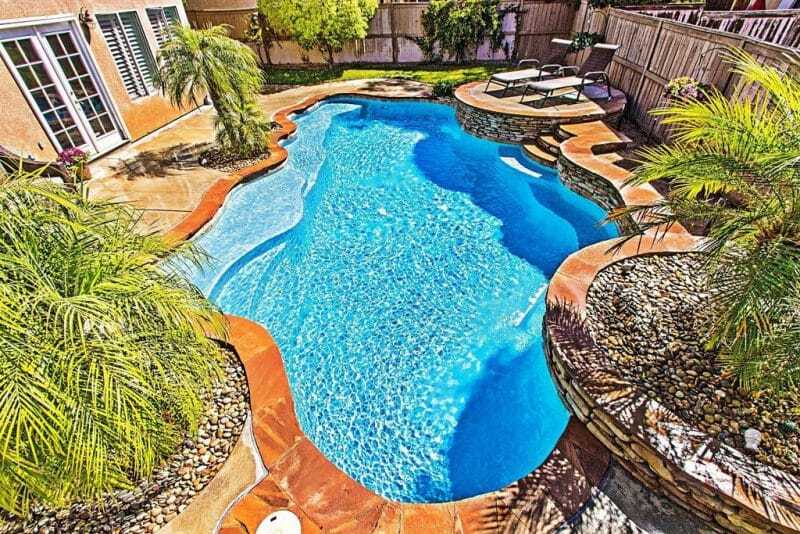 So if a pool means vacation to you, you will find small backyard pool ideas below so you can start your mini getaway…whenever you want…right outside your back door. And as you will see with these small pool photos, they come in many shapes and styles. Contemporary designs often feature a rectangular layout (although you will find these shapes in more rustic or Mediterranean styles also). Circular or semicircular as well as water features (e.g. beach entries, slides, waterfalls and fountains) are good options for a more tropical, vacation like feel. Now, if you’re looking for exercise, lap pools are a good choice while spa pools and hot tubs are more geared towards relaxation. 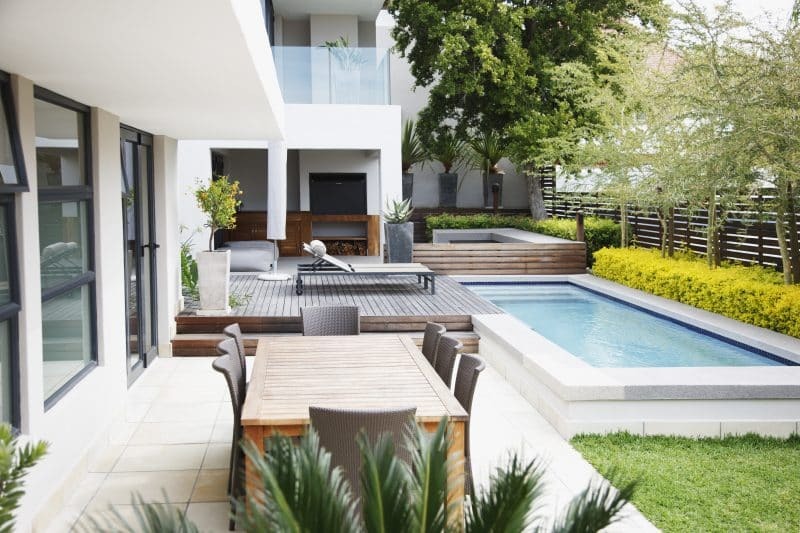 And consider extending the pool with a lovely deck, it will add an al fresco dining area and make your backyard the go-to spot on the block. So are you ready to jump in and check these inspiring small backyard pool ideas with us? Hope you find them refreshing. Enjoy and beautiful day to you! The Little Plus: the hot tub elevated with stone surround. It complements the natural surroundings and is conveniently located to foster conversations with people in the fire pit area. And with two separate areas to relax in, this backyard offers you options on where to lounge depending on the time of the day…and your mood. The elevated seating area with portable fire pit can be a cozy spot on colder nights or just chatting with friends over drinks. Santé! 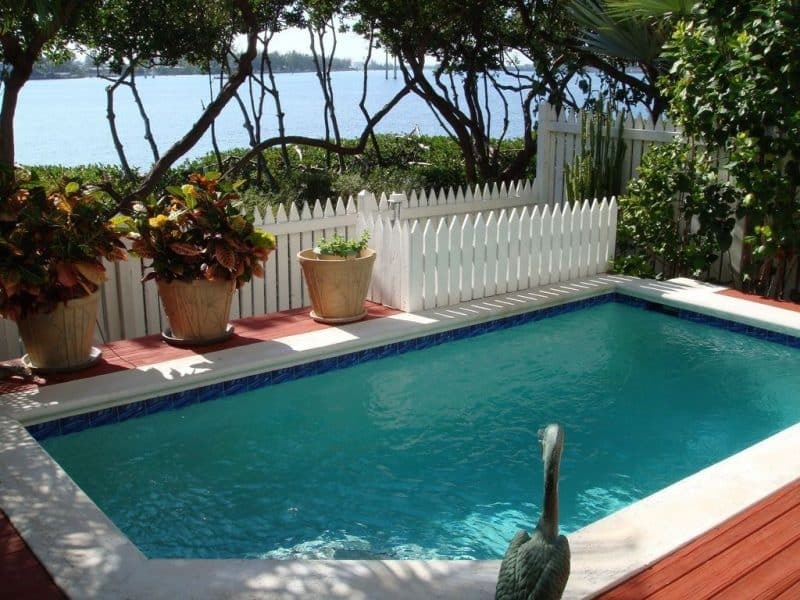 The Little Plus: the wooden plank fence and the lush backyard makes you feel like you are on your own private island. Keeping with the tropical theme — flower planters, palm trees, natural stone decking and a stacked stone grotto contribute to the tropical secluded vibe. Margarita anyone? The Little Plus: the lap pool — long and narrow, great for low impact exercise. The gray and white natural, polished pebbles around the pool fits well with the modern look of the patio area and is also non slippery. Also, notice how the wooden fence, bright green hedges and trees act as a privacy wall. And the intimate wooden deck area offers a relaxing spot after your morning exercise. The Little Plus: the free form pool design. It blends with nature and includes inlets of trees and shrubbery. Pedestal deck area gives a good vantage point to watch over the children and also for catching the first rays of sun. Incorporating that natural touch are the rust-colored stone pool surround and stacked stone design.